A new illustrated book, "Ladies of Kirk," features drawings and descriptions of the many women encountered (and kissed) by Capt. James T. Kirk on "Star Trek." A famed "Star Trek" captain's romantic conquests have come to life in a new illustrated book. The new book showcases all the women Capt. James T. Kirk of the original "Star Trek" kissed over the course of the show, which ran from 1966 to 1969. Advertised on the crowdfunding website Kickstarter, "Ladies of Kirk" more than quadrupled its $2,500 goal, reaching $11,253. 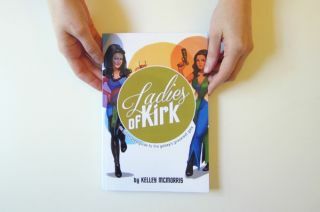 "Part celebration of the women of Trek, part loving parody of our favorite Captain, 'Ladies of Kirk' is a fully illustrated original art book," the project's artist, Kelley McMorris, said on the book's Kickstarter page. "Brilliant lawyer Areel, shape-shifting telepath Sylvia, wholesome Edith Keeler — they're all here," she wrote. "One captain, 19 women, one book." The 6 inch by 9 inch (15 centimeters by 23 centimeters), 42-page full-color book includes 19 illustrations and a short summary of every character. McMorris describes herself as a professional illustrator who grew up loving "Star Trek." "I was impressed by the sheer diversity of these women, in their personalities, employment, motivations and costumes," she wrote. As the campaign progressed, McMorris added more perks for the backers: At $4,300 in total donations, all backers who contributed at least $15 were entitled to a bookmark with Kirk on one side and the crewmember Spock on the other. At $8,600, she added a downloadable coloring book. The campaign runs just weeks after the actor who played Kirk, William Shatner, tweeted a fan-driven pictorial tribute to Spock's actor (Leonard Nimoy). Nimoy died earlier this year at age 83; the men were lifelong friends after co-starring in the series. "Star Trek" lives on through several fan campaigns (such as "Star Trek: Axanar") and in Hollywood; a new film from the rebooted series is expected to be released in 2016.